Since I have a new Hart 7/8, I knew I would spend the morning improving it. 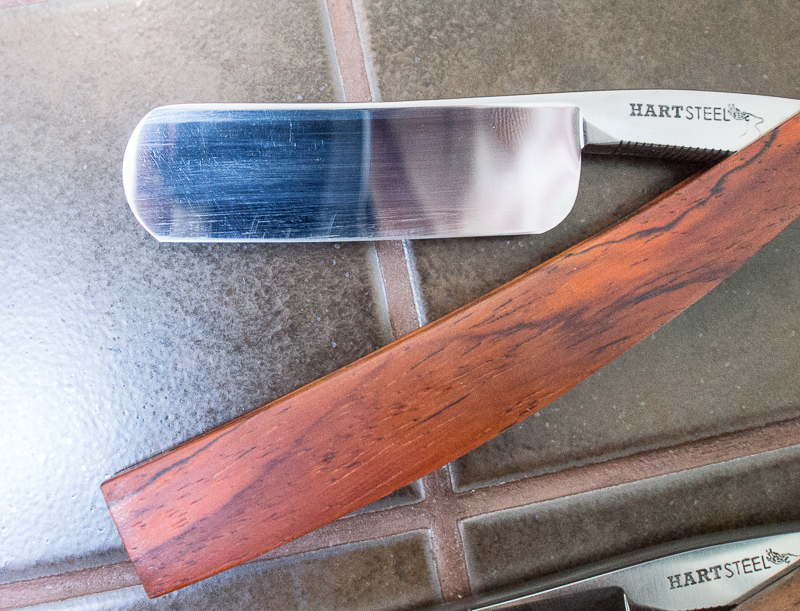 Harts come sharper than any other brand of razor, but that doesn't mean they can't be taken a little further. I also had to touch up my everyday Friodur and since I have noticed that Friodurs like the naniwas I decided to get them up from the basement and use them instead of my set of Shapton Professionals. I don't know quite why this happens, but a razor taken through the Naniwas one after another ends up with a beautiful edge. Mix them with other hones and you don't seem to get the same results. I daresay a really good microscope could help sort that out. Usually I hone with some arcane recipe of X strokes, but haven't done circles since I found I had to when desperate to get edges on those wretched stainless faux damascus Dovo razors back about ten years ago. 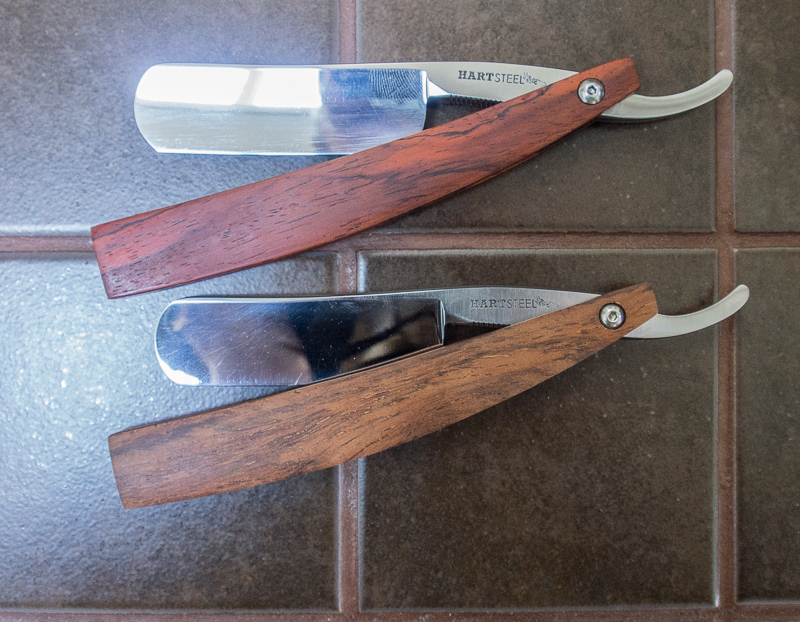 I understand that Lynn Abrams has pronounced it a kosher honing method so I thought I'd entertain myself by doing both razors this way, on the Naniwas. As always I used a Shapton lapping plate to clean up the hones (also good for making slurry when doing bevels with 1k and 2k hones), then followed Lynn's approved circle method, but stopped at all the hones rather than skipping. Since each razor needed only touching up I didn't bother with the coarser hones, but went 3k, 5k, 8k, 10k and then 12k. 3k: 40 circles with pressure each way, then 25 x strokes. Then 10 laps on a chrome strop, canvas and leather strops. Both feel as if they have excellent edges. Now my problem is which to use tomorrow! I have never subscribed to the rumour that Harts are hit and miss. It seems I have nine of them now, and nothing wrong with any of them till these scratches. At least they are easily fixed. I'll polish with diamond paste and they'll soon be gone. Chris, I've forgotten. Do you tape the spines for honing? For wedges, quarter and half hollows, yes. Full hollows, only if they have a gold wash I don't want damaged. I always tape, just one layer. Spine wear notwithstanding, the noise it makes if I happen to forget is like scratching a blackboard, it's horrifying. My Norton's have served me well but the end is near. My replacements will be Naniwas. I've got two, the 2K and the 12K. They're smooth and they seem to work very well. I think my next addition will be the Suehiro Gokumyo 20k - maybe no chrome strop needed with that if the rumours are true. That will be money well spent. Dr. Moss, I agree it will be money well spent. To an extent the rumors are true the Gokumyo 20k is an excellent hone and it does take the place of a pasted strop BUT be aware that the edge fades fast. As with most extremely fine edges there seems to be a diminishing law of returns. 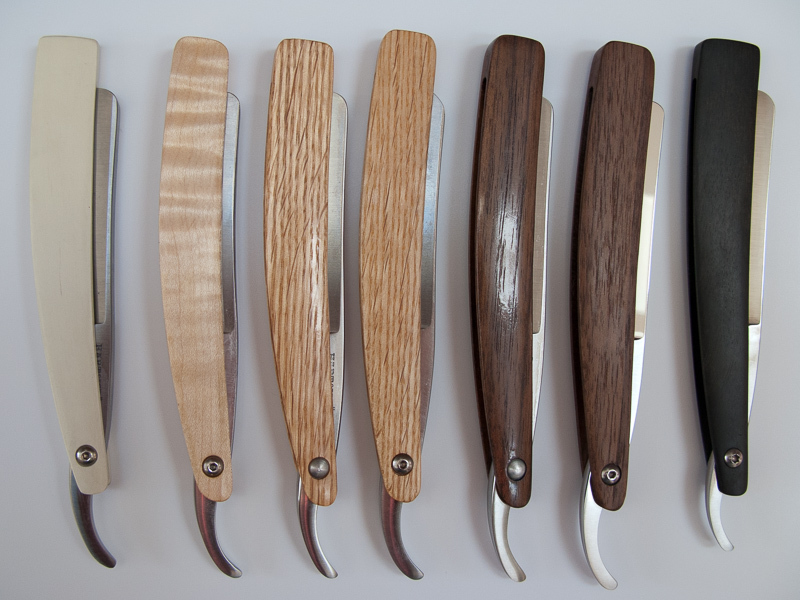 The edge after a honing seems to last but a shave or two and then degrades a bit for about a week. With the Dovo white paste it can be extended but not at the rate it first attained but still with comfortable results for a week. From there it degrades even more to harsher shaves. The hone also can take a bit to dial in when first acquired. That said it does an excellent job at it's function. I think the degradation is a natural result of such a keeness of edge. The chrome pasted strop has similar results but may last a bit (not much) longer because of rounding of the edge. The nice thing about the rounded edge is that is can be refreshed easily and quickly over this hone because it seems to better smooth out the micro-imperfections better. The jury is still out on this though. I am thinking that for straights a happy medium may be the duller, yet stronger, edge that lasts longer. More experimentation is needed on that and the fallout may be a sacrifice in comfort. We shall see. 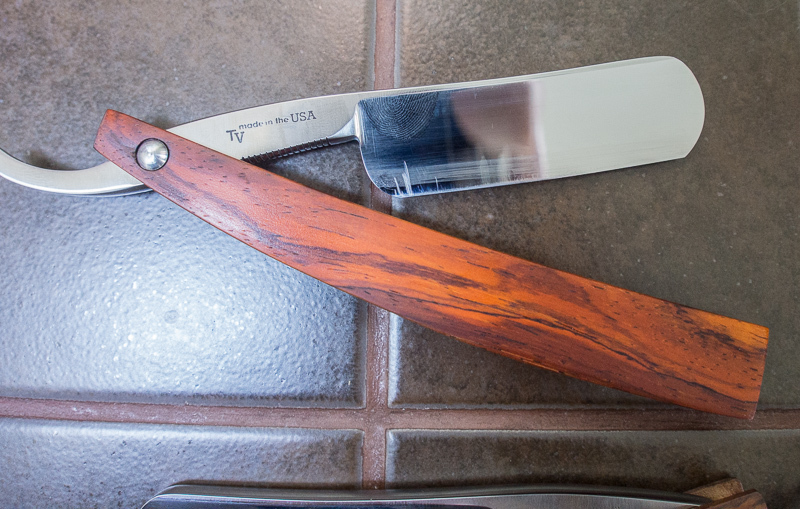 One thing that I find the Gokyumo is excellent at is an unintended benefit: if you breadknife the edge of a harsh blade on it then that edge will take little effort to rehone to a shave sharp state and it will be very smooth as the Gokyumo doesn't remove much metal. It seems that it removes just enough metal on the microscopic scale though for this purpose. That's the report from the field thus far and everything is subject to change as we experiment further. Interesting about the Gokumyo 20K. I'll start reading all I can on the subject, and see what the consensus turns out to be. So far, most reports seem to be positive. brothers wrote: I always tape, just one layer. Spine wear notwithstanding, the noise it makes if I happen to forget is like scratching a blackboard, it's horrifying. Oscar11 wrote: My Norton's have served me well but the end is near. My replacements will be Naniwas.